Last weekend was another great SWAK Knit Out weekend. I don’t know how Keely does it every year – there is a tremendous amount of work that goes into the planning and executing of such an event. When I arrived late on Thursday to set up for the LCK Trunk Show that was beginning the following morning two of the three teachers had yet to arrive. Fiona Ellis made it from Toronto to Oklahoma without much mishap. Franklin Habit later arrived from Chicago without much trouble but Jane Thornley and her husband had a dickens of a time getting to Guthrie, OK from Nova Scotia. Problems on each end of the flight resulted in Jane and the Hairy-Legged-Swift (as she calls her devoted spouse) riding a bus from Tulsa, OK during a thunderstorm to Guthrie and arriving at 4am. I had enrolled in Jane’s Yarnscaping class that took place at 2pm on Friday and it was hard to tell that she’d only had a few hours of sleep. The inspirational Yarnscaping class included Jane passing around her first yarnscaping journal so we could all see and understand how she had begun to create her own designs from museum visits, flowers, and paintings. Before long we all had a chance to use our sketch books and colored pencils to begin something unique and seemingly unstructured. I say seemingly because while Jane’s style grows organically it does help to have some understanding of garment construction and have a few known stitches in your repertoire. Friday night Franklin Habit presented an excellent presentation on knitting in history with detailed accounts of translating famous works like Jane Gaugain’s Knitter’s Assistant and Weldon’s Practical Knitter into something a modern knitter can understand. While Franklin is obviously brilliant, his wicked humor kept us laughing all evening. My Saturday class line-up included Fiona Ellis’s Morphing Cables. 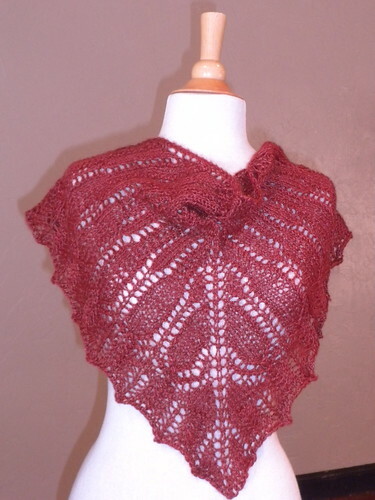 Fiona is not only sweet and funny but has a glorious style with cables as is evident in her book Inspired Cable Knits. She’s also addicted to icord and uses it as a design tool. Since it’s been a few years since I’ve done any cabling I am very glad I enrolled in Fiona’s class. Now I have a better understanding of how to take a simple cable and create something as elaborate as a celtic knot in a cabled garment. After a leisurely lunch I headed back into class this time with Franklin to gain a little more experience with Lace Edgings: Before, During and After. 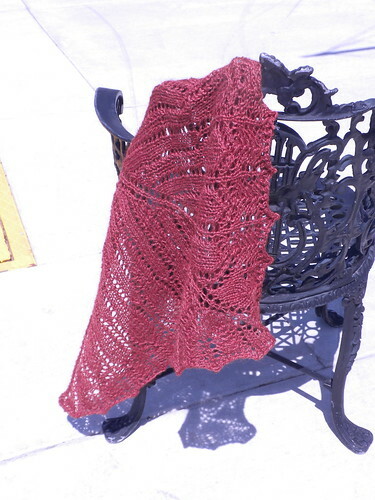 If you’re into lace – this can be a very important class to take. 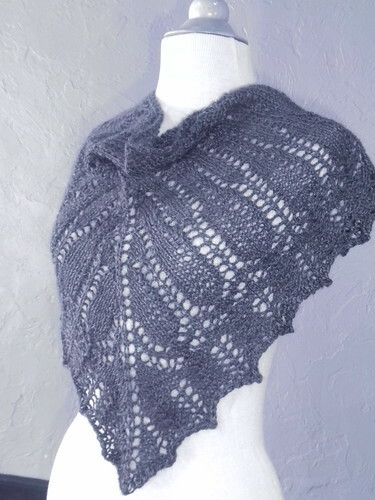 What I discovered was that I’m completely capable of adding a lace edging to the outside of a finished shawl. I don’t know why I’ve shied away from this for several years. 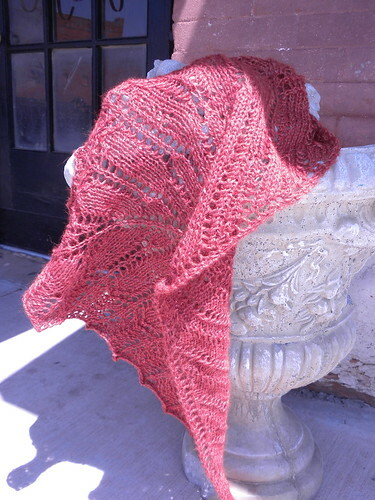 It’s not nearly as scary as say…steeking. With another evening shindig that included a fashion show of numerous knitted patterns from books we’ve all drooled over I finally had time to hang with my good friend Cathy who’d driven to Guthrie to “yarn sit” with the trunk show while I was in class. Cathy and I have done Knit Out together numerous times in the past and it’s just not a Knit Out if I don’t get time to unwind over a bottle of wine with Cathy! You may be wondering where are all the photos that go along with such an adventure? For some reason I was having so much fun that I never pulled out my camera until Sunday during Franklin’s Photographing Your Fiber class. Generally when you see nice photos on my blog they’re the work of Christopher. Mine are ummm… somewhat more amateurish. I have a sweet little point and shoot Nikon Coolpix. It’s not unwieldy, it fits in my purse, and yet is still a good bit beyond my ken. Apature? White Balance? Depth of Field? (well I do kind of understand that one without much explanation) Shutter Speed? Lighting is different colors? It’s enough to make my head spin, but Franklin has a way of making all this important information much easier to understand. While I still have a long way to go I’m now more comfortable with experimenting and not getting frustrated with the results of my photography. 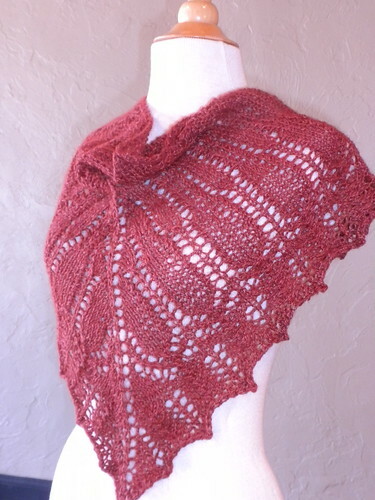 I took a few standard photos of my newest Monarch Shawl (Llama Bamboo Sport colorway Red Dirt Roads). 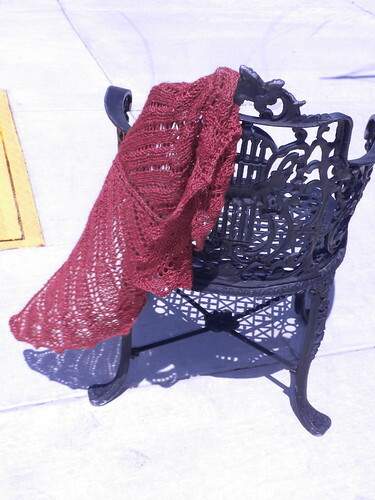 The lighting is pretty decent in this first one but for some reason I’m still getting my angles wrong and catching things like the baseboards in the photo, or cutting the tips of the shawl out of the photo. All of the following are my unedited photos. 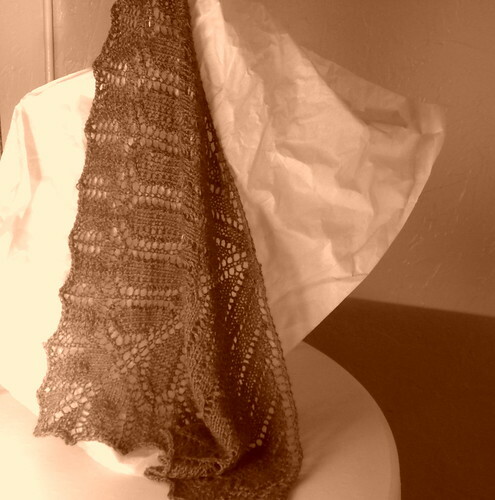 My camera has several fun settings that for the first time I played with – like black & white and sepia. You all know me well enough by now to know I like to get outside and have some fun, so I took the Monarch out onto the sidewalk and draped her over a broken cement plant holder. Not as fun as I’d hoped. 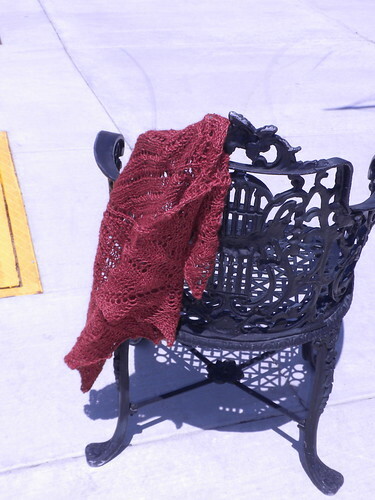 Then I spied some great wrought iron chairs and pulled one out of the shade and into the light. 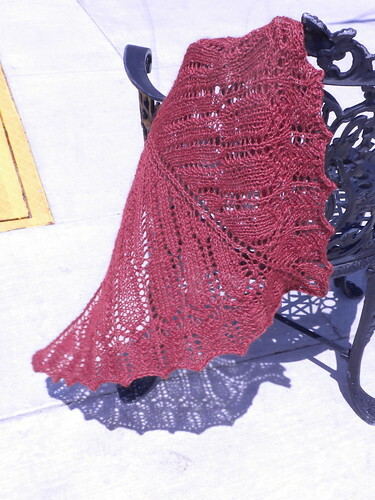 The wind began to lift the edges and for some reason I forgot about trying to get a good shot of the shawl pattern overall and spent my efforts trying to time the clicking of the shutter button to catch when the wind would pick up the edge of the shawl and give a nice shadow on the sidewalk. It’s trickier than it sounds considering I don’t have (or haven’t found) a continuous option on my camera. You know what I mean right – that rapid fire clicking of the paparazzi snapping thirty photos in as many seconds? 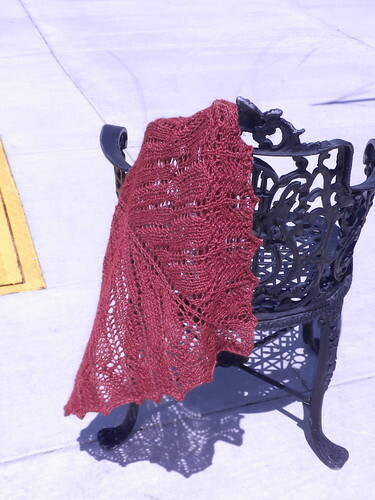 I’m still catching things like the yellow sewer grate in my photos and missing the very edge of the shawl as the wind whips it around but I’m more confident than I was last week. It’ll take some time before the information I learned in Franklin’s photography class becomes second nature but I’m learning! 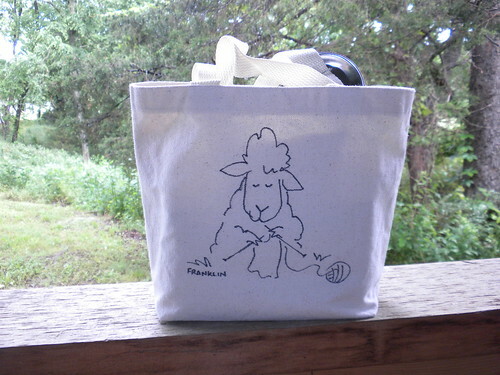 To commemorate the weekend – Franklin drew Dolores on my new knitting project bag! 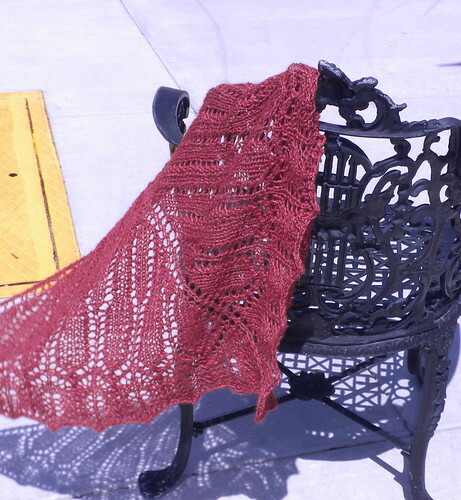 This entry was posted in Interesting People, Interesting Places, Monarch Shawl by lostcityknits. Bookmark the permalink. What a fabulous weekend it was!!! Watching the edges of your frame was one of those things that took me a long time to master – and I still slip up now and again. Monarch is such a pretty pattern. 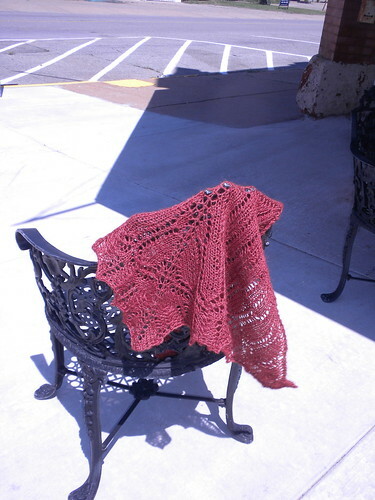 I have some yarn dyed up for it – just waiting for it to dry. 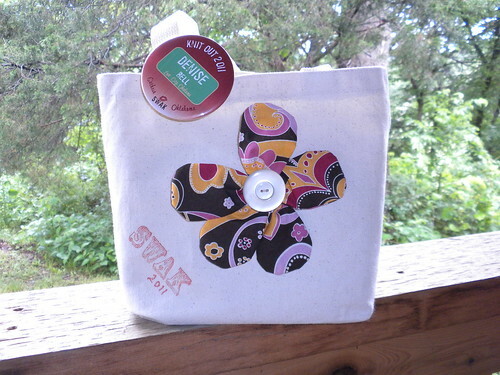 Love the bags, too. It sounds like you had a great time.